Why Determine the Soil Resistivity? Soil Resistivity is most necessary when determining the design of the grounding system for new installations (green field applications) to meet your ground resistance requirements. Ideally, you would find a location with the lowest possible resistance. But as we discussed before, poor soil conditions can be overcome with more elaborate grounding systems. The soil composition, moisture content, and temperature all impact the soil resistivity. Soil is rarely homogenous and the resistivity of the soil will vary geographically and at different soil depths. Moisture content changes seasonally, varies according to the nature of the sub layers of earth, and the depth of the permanent water table. Since soil and water are generally more stable at deeper strata, it is recommended that the ground rods be placed as deep as possible into the earth, at the water table if possible. Also, ground rods should be installed where there is a stable temperature, i.e. below the frost line. For a grounding system to be effective, it should be designed to withstand the worst possible conditions. Setup for soil resistivity testing using the Fluke 1623 or 1625. How do I Calculate Soil Resistivity? The formula is: Divide ohm—centimeters by 100 to convert to ohm—meters. Just watch your units. Example: You have decided to install three meter long ground rods as part of your grounding system. To measure the soil resistivity at a depth of three meters, we discussed a spacing between the test electrodes of three meters. How do I Measure Soil Resistance? 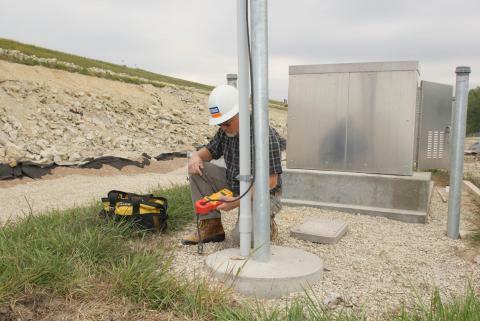 To test soil resistivity, connect the ground tester as shown below. As you can see, four earth ground stakes are positioned in the soil in a straight line, equidistant from one another. The distance between earth ground stakes should be at least three times greater than the stake depth. So if the depth of each ground stake is one foot (.30 meters), make sure the distance between stakes is greater than three feet (.91 meters). 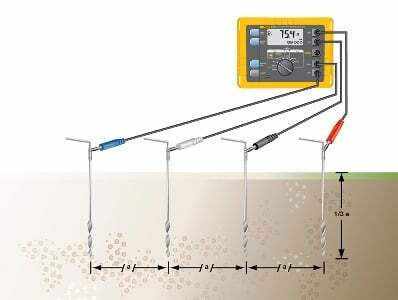 The Fluke 1625 generates a known current through the two outer ground stakes and the drop in voltage potential is measured between the two inner ground stakes. Using Ohm's Law (V=IR), the Fluke tester automatically calculates the soil resistance. Because measurement results are often distorted and invalidated by underground pieces of metal, underground aquifers, etc. additional measurements where the stake's axis are turned 90 degrees is always recommended. By changing the depth and distance several times, a profile is produced that can determine a suitable ground resistance system. Soil resistivity measurements are often corrupted by the existence of ground currents and their harmonics. To prevent this from occurring, the Fluke 1625 uses an Automatic Frequency Control (AFC) System. This automatically selects the testing frequency with the least amount of noise enabling you to get a clear reading.